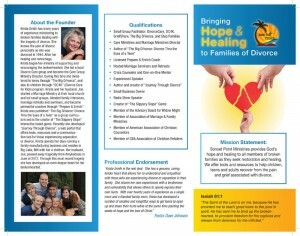 Journey Through Divorce is a resource provided through Sonset Point Ministries that is available to families who are going through a separation or divorce. Whether you had been married 60 years or 6 months, divorce is one of the most hurtful losses we are forced to deal with. Right now over 65% of all married couples are getting a Divorce. You are not in the minority. Journey Through Divorce is a tool that will make your journey easier and less hurtful for yourself and those you love. Whether you have children or are alone, divorce has a way of affecting all those you love and care for. It is my desire that through this membership you will learn better ways to deal with situations, find a place to get advice and material that will help guide you through your journey.